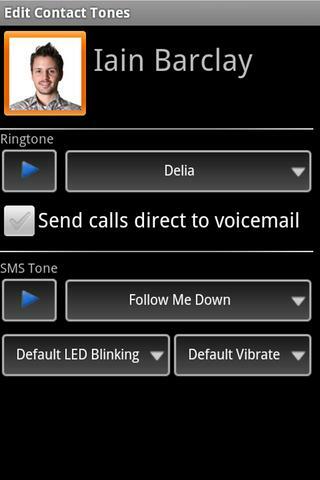 Overview: Set MP3 ring and SMS tones for contacts, get total control of notifications! Supercharge your Text & Call Notifications with Ringo Pro, the leading customisation app for Android! Ringo lets you easily pick and use any MP3 music file as your ringtone - and set individual ringtones for each of your contacts and caller groups. In fact, Ringo Pro allows you to customize almost every aspect of ring tone and SMS notification. If you are one of the many people who don't notice the polite vibrating of the phone when it rings, Ringo Pro offers a much stronger vibration. Vibration patterns are aptly named: Discreet, Classic, Enthusiastic, Frenzied, and Relentless. Ringo Pro will really shine as you start to apply its custom settings to caller groups and to individuals in your contact list. Each person can be assigned a unique ring tone, unique SMS tone, their own color of blinking LED (on phoens that support it), and a unique level of vibrate intensity. You will know instantly whether a call is from your brother, boss, or broker. One user sets a discrete ring tone and SMS tone as a default, then gives each important caller his or her unique tones. Ringo Pro is packed full of customization options, so you can configure your incoming calls and SMS Text alerts exactly how you want them! We've adjusted our SMS priority, which should help with stray notifications for emails.